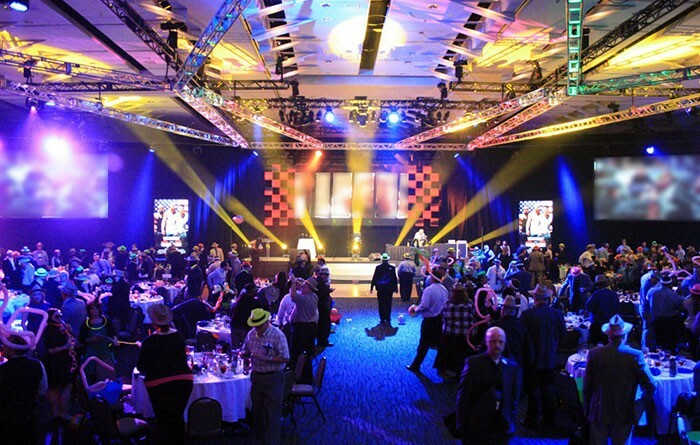 Movie theatre powerhouse Regal Entertainment Group recently held its General Manager Conference at the Knoxville Convention Center. The three-day conference started on April 8 and included sneak peeks into upcoming theatrical releases, presentations varying from safety and marketing, and insight into best business practices. With 6,854 screens in 537 theatres at the time of this writing, Regal Entertainment Group is the largest and most geographically diverse theatre circuit in the country, and required a lighting design befitting the royally inspiring name. Lighting designer Giff Swart adeptly created a massive design that imitated Regal’s crown logo. Fifty-nine Chauvet color dash accents illuminated the trussing with the red, yellow, blue and green colors surrounding the crown. "I wanted to give them something a little more than just a utilitarian structure to hang lights on," explained Swart. "I wanted something that would both be memorable for the attendees and also represent the brand as the giant they are." "Giff did a tremendous job with the design," said Bandits’ general manager, JR Sander. "Regal just absolutely loved it." Additional equipment included Mac 2k washes with beam kits that simulated the sky trackers often associated with movie premieres, and VL 3000 spots for gobo patterns and wall texturing. 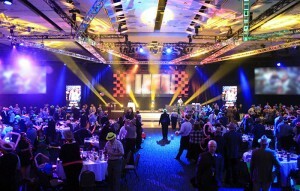 One of the more challenging aspects for the event was making each event look unique in the same room. Regal wanted breakfast to have one look in the morning, the lunch to reflect a different atmosphere, and the big dinner to make a different statement, all while taking place in the same room of the conference center. "Fortunately we had a really creative, responsive team," said Sander. "From breakfasts to dynamic dinners with sponsors ranging from film studios to ticket agencies, the team made sure the lighting reflected the feel of the event." Andrew Heid worked as the lighting director for the event, with additional support coming from Scot Sepe and crew chief, Chuck Hastings.